Many fitness fads come and go, but Pilates has proven its staying power. People looking to find focus and build a strong core, excellent posture, and a balanced, aligned body need look no further. A staple on the schedule at health clubs and community centers nationwide, Pilates classes and Pilates-focused studios are a testament to the growth in popularity of this method of exercise. Despite firmly establishing its place in the fitness mainstream, there are some common misconceptions about Pilates. 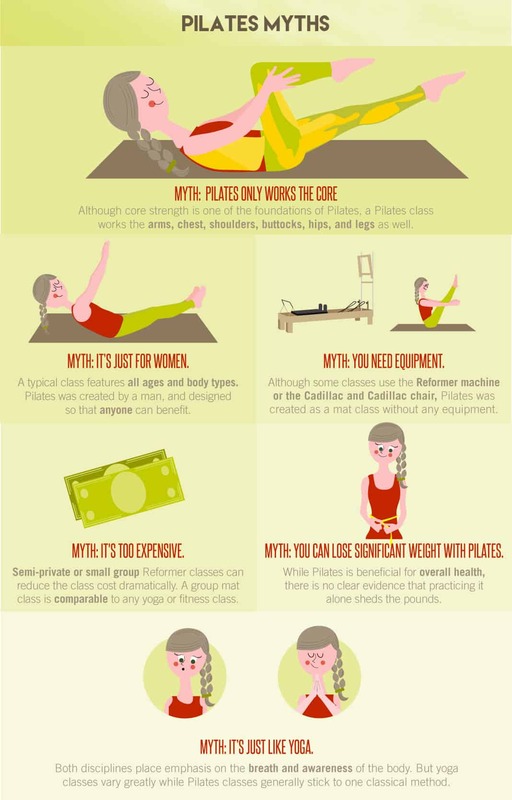 In order to bust those myths, it’s helpful to know how and where Pilates got its start. Originally named “Contrology,” Pilates was created by Joseph Pilates during World War I while he was a prisoner of war in England. He developed a collection of body-conditioning exercises to strengthen the core and postural muscles while balancing the musculature of the body through precise and efficient movements. When Joseph Pilates brought his exercise regimen to New York in the 1920s, the technique became popular in the dance community. Dancers recognized that Pilates could complement their training by strengthening and toning muscles while also maintaining stability and flexibility. Pilates became known as a successful method of injury prevention as well as a rehabilitative technique for injured dancers and athletes. It gradually drew attention of the Hollywood set, and as a result of its increasing status in celebrity circles the fitness phenomenon steadily grew in popularity from the 1980s on. 1. Pilates only works the core. Although core strength is one of the foundations of Pilates, there is much more to a class than just working out the abdominal and postural muscles. The Pilates system is designed to promote stability, mobility, strength, and flexibility in both the intrinsic (deeper) and extrinsic (superficial) muscles of the entire body. Each class involves exercises in four basic areas of movement: flexion, extension, side bending, and twisting. 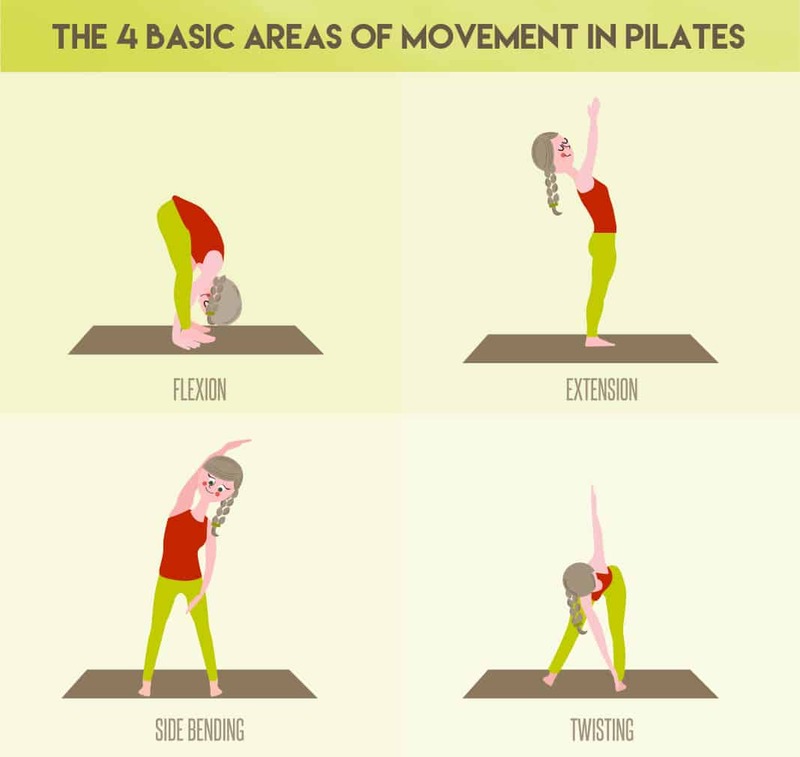 Although core stability is necessary for efficient movement in all of these areas, a Pilates class works the arms, chest, shoulders, buttocks, hips, and legs as well. Within each category of movement, there’s attention to precise alignment and placement of the body in space. This specificity requires the Pilates student to exert control over the entire musculature of the body, increasing awareness of everyday functioning and promoting balanced movements within (and outside of) a class. 2. It’s just like yoga. There are some basic similarities between yoga and Pilates. Both disciplines place emphasis on the breath and awareness of the body. But since there are many types of yoga, each class can vary greatly. Some yoga classes will focus on relaxation and gentle stretching, while others will focus on strength, power, and fluid movement. For example, a gentle Hatha yoga class and a Vinyasa flow class offer very different postures, philosophies, and benefits. With Pilates, the fundamentals of a class remain consistent from class to class. Joseph Pilates designed a specific order to the classical Pilates method, and although some variations on this routine have developed over the years, the principles of all classes remain the same. Focus on the core and move from a stable center. Bring full attention to each movement. Remember, every movement is specific, and all parts of the body are involved in each movement. Work toward correct alignment and placement of the body for controlled movement. Use a full and active breath coordinated with physical movements. Although yoga offers some (or all) of these principles depending on the class, the method of delivering them is more diverse and less consistent in structure than Pilates. Most yoga classes have spiritual philosophies incorporated into their teachings, whereas the objective of Pilates is to facilitate the effective organization of the body through movement. 3. It’s just for women. There is a common stereotype of a Pilates class filled with lithe, young females or dancers, but the reality is far different. A typical class features all ages and body types. Pilates was created by a man, and was designed so that anyone—regardless of age or physical abilities—can benefit from the exercises. Many high-profile male athletes, including tennis star Andy Murray and basketball great LeBron James, credit Pilates for facilitating injury recovery and balancing training routines. Pilates has also become popular within clinical settings. It is common for physiotherapists and chiropractors to prescribe Pilates as a therapeutic technique for clients (both male and female) with back issues or physical imbalances. The idea of working out on unfamiliar equipment can be daunting and some people aren’t interested in trying the Reformer machine or the Cadillac. Although many students who use the Reformer credit the machine with an extremely focused and challenging workout, Pilates was originally created as a mat class without any equipment at all. Joseph Pilates created the series of exercises so it could be practiced anywhere, by anyone. Even after developing the machines he is now famous for, Joseph Pilates expected his clients to regularly return to “mat practice.” He believed mastering mat exercises actually required the most physical control and was essential for all students. Although working out on machines or taking classes using a stability ball and/or Pilates ring may have great appeal to some, Pilates can always revert back to its purest form: No equipment necessary. Like any workout, there are a variety of ways to experience a Pilates session, and the options don’t have to be pricey. One-on-one machine classes will obviously be more costly than a group mat class, considering a private class involves one person paying for the cost of the instructor’s time, the use of the machine, and studio time. Most Pilates studios and gyms offer semi-private or small group Reformer classes, which can reduce the class cost dramatically. A group mat class is even more financially accessible and comparable in price to any yoga or group fitness class. If access to a studio or health club isn’t an option, there are a wide variety of Pilates workouts available for free online. 6. You can lose significant weight with Pilates. Many students praise Pilates for the way it makes them feel, but there is no clear evidence that Pilates alone helps shed the pounds. There are many variables that will affect a Pilates workout, such as intensity of the class and the weight of each individual, but an average woman will burn approximately 200 to 300 calories in a beginner class. Perhaps it’s more important to see Pilates beyond calorie counting: It’s good for overall health. By maintaining a strong, balanced body that is less prone to injury, Pilates students can engage safely in other high-intensity physical activities, such as running or playing squash. Pilates also improves posture, builds strength, and encourages conscious movement. All of these benefits are arguably far greater than the numbers on a scale. Once the myths surrounding Pilates are busted, it’s clear—aside from the many great physical benefits—Joseph Pilates created an effective exercise system that can be practiced safely in various different forms by anyone, regardless of age, height, weight, or gender. Annabel is a writer, yoga and Pilates instructor, health and wellness speaker, playwright, runner and triathlete. She is also – more importantly – a wife, and mother of two fabulous and energetic kids. Annabel is passionate about wellbeing, fitness, and helping people make time for the things that make them happy. She combines her enthusiasm for yoga and wellness with her love of words to encourage healthy and whole living. She can be found at www.annabelfitzsimmons.com or over at her MeditatingMummy blog.